I grew up watching Fantasy Island, (and Love Boat and Hee Haw, and Land of the Lost, and...) On Fantasy Island everyone seemed perfect; Perfectly dressed. Perfectly loved. Perfectly flown onto the island by a perfect little seaplane. Greeted by the charming and perfect, little Tattoo. Perfectly awarded some adventure by Mr. Roarke. Even as a child I knew this was just a television show with actors in white suits. No amount of lights, costumes, and makeup could prove to me that Fantasy Island was real. As an adult, I’ve learned that fantasies are the ideal, not the norm. I have a secret to tell you: Fantasy Island does exist. It's called Martha's Vineyard and it sits in the Atlantic Ocean off the coast of Massachusetts. Why is it my real life Fantasy Island? Because on Martha's Vineyard the sky is bluer. Pastures are greener. Food is more delicious. People are happier. Flowers bloom like exploding fireworks in neighborhood lawns. The water is clear and always the perfect temperature for sailing/swimming/fishing/wading. Farmers markets offer award winning produce. Artists create masterpieces. There is no hurry, no worry. Can you tell how much I love it? It’s my favorite place in the United States. During the summers of 2003 and 2004 I cooked for a family in one of the towns on the Island called Chilmark. Those summers changed me. I worked my tail off but I felt like I was in paradise. Those summers offered so many lessons. I learned how to improvise in the kitchen, to always expect the unexpected. To prepare more than I think I need, and that simple is better and fresh is best. The fruits of these lessons were eaten by some amazing guests...Hillary and Chelsea Clinton, Caroline and Ted Kennedy, Jake Gyllenhaal, Larry David and many non recognizable but famous-in-their-own-right names. Everyone’s a VIP when it comes to food, remember? Especially on the Vineyard. I try to go back to Martha’s Vineyard every Summer for a fantasy getaway. 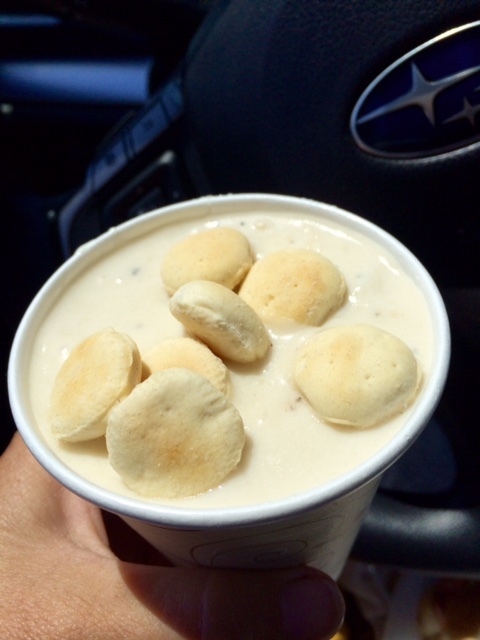 Sometimes a day trip, sometimes an extended stay, but it is always a food tour. I just returned from a three day mini vacation with my partner in All Things Good, Christopher, who dutifully edits this blog every week. To this day, his All Good Things guest blog installment has received the most traffic and buzz. Christopher had never been to the Vineyard, so I couldn’t wait to share it with him. I planned out nearly every minute and meal of the trip. Luckily he was up for the adventure and trusted me. Here’s a roundup of our 3 days: Take notes because these are all the Good Things you want to fit into a Vineyard trip. 36 minutes in the air from JFK on Jet Blue, pick up the rental car at the airport, drive to Edgartown where we were hosted by The Vineyard Arts Project. Stopped at Morning Glory Farm on the way to pick up a watermelon, Pam’s Provisions Pesto (my absolute favorite condiment on the planet) and Monkey Bread which is a banana chocolate and coconut quick bread. Rest up before dinner at State Road restaurant in West Tisbury. We enjoyed some of the freshest lettuce and vegetables we’ve ever eaten as they were just picked from the garden outside the restaurant door. Wake up to a glorious morning of crisp island air and a walk to the brand new Rose Water Market in Edgartown for coffee. A dreamy little gourmet market that opened the day before we arrived on the Island. I could start each and every day there! Drive back to West Tisbury to the Farmers Market for a breakfast of Vietnamese cold rolls from the famous Egg Roll Lady. Stop in at Fiddlehead Farmstand and pickup gourmet caramel corn and Island sea salt. We peeked into the Scottish Bakehouse for a loaf of oatmeal bread to take back to New York City. The bakery is right near Carly Simon’s farm and we passed one of the Taylor boys as we were leaving. We kept on driving to explore the gingerbread houses of Oak Bluffs and the main street of Vineyard Haven. My favorite stores in those towns are Sanctuary and Carly Simon's boutique Midnight Farm. We had an unplanned stop on the food tour for a lunch of tacos and short rib sliders at The Ritz, a local bar and kitchen established in 1944. We dipped our toes into the water at Town Beach along Beach Road as we headed out of Oak Bluffs. Dinner reservations were in Edgartown so we headed back to Vineyard Arts and parked the car. 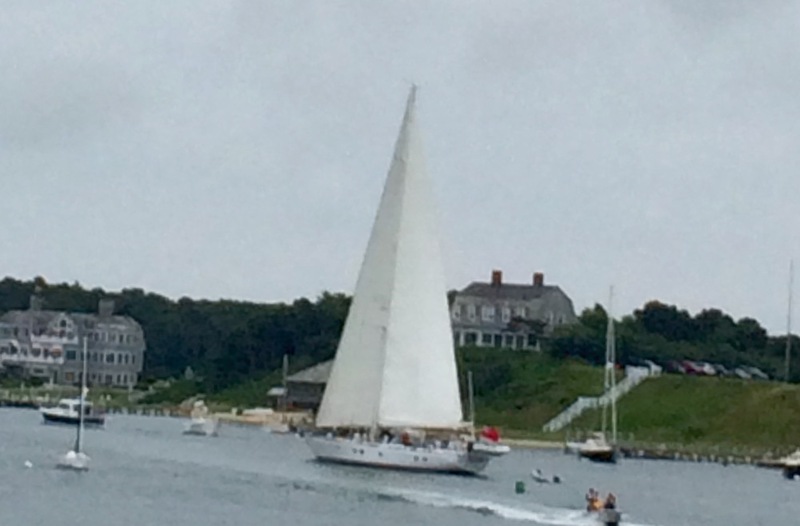 We explored Edgartown on foot and sat by the water to watch sailboats come into moor in the marina. One of the finest stores in Edgartown for books, antiques, and curios is Portobello Road. Dinner was at Alchemy and we had fresh oysters from Katama Bay and a zucchini haystack with almonds and pecorino that is the best thing I ate in three days. I will be figuring out that recipe soon. Breakfast was our Morning Glory Farm watermelon and we headed back to Rosewater Market for coffee and to stock up on gourmet chocolate bars. This was Chilmark, Menemsha, and Aquinnah day, so we headed up-island, stopping in at the Artisans Fair in West Tisbury on the way to pick up a few gifts. I shared Chilmark Pottery with Christopher where he gifted himself the perfect handmade coffee mug. In Menemsha we stopped for a cup of clam chowder at The Bite (which was Christopher’s favorite stop on the food tour) and kept going around the bend to Larsen’s Fish Market for lobster rolls. We enjoyed these on the beach in Menemsha and took a little walk along the breakers and imagined what it was like when the movie Jaws was filmed there in 1975. We drove to the lighthouse in Aquinnah, or Gayhead, and then parked to walk the beach and see the Gayhead cliffs. I have dreams about this beach and these cliffs. My days off in 2003 and 2004 were spent walking the beach for hours collecting wampum shells and dreaming of abundance as they used to be currency for the Native Americans. 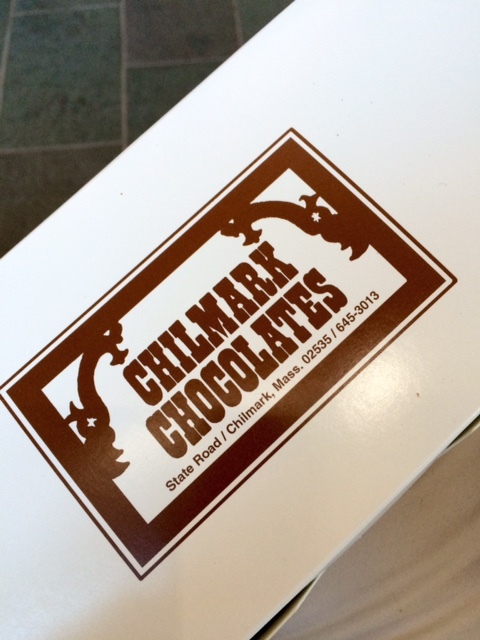 Last stop before heading to the airport: Chilmark Chocolates! 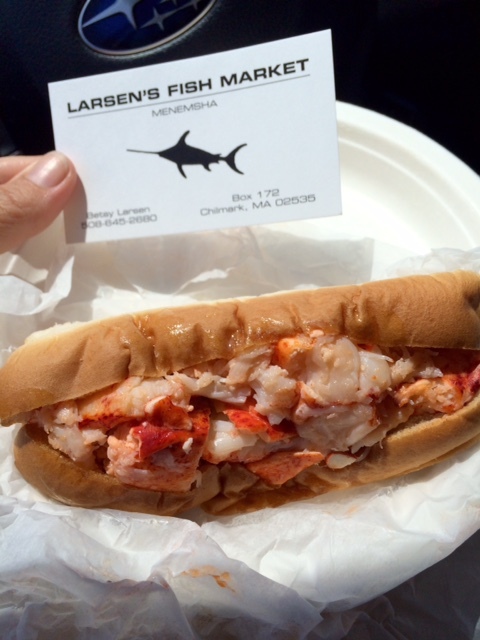 Coming here is reason enough to make a trip to Martha’s Vineyard. I have eaten some of the world’s finest chocolates and this little chocolate house remains my favorite chocolate destination. The sweet ritual of tasting one free sample after waiting in line for what seems forever and then curating your own personal box of Island named chocolates all individually placed into candy papers and delicately layered into the white and brown box is what Fantasies are made of. The one thing we weren’t able to fit in which is normally a highlight on my Martha’s Vineyard food tour, is getting a Gobbler Sandwich at Humphrey’s Bakery. I told Christopher a story of one of my summers cooking for the family in Chilmark. It was a regatta race day and my only instruction was to pick up two Gobbler sandwiches from Humphrey’s so my boss and his racing partner could have them for lunch on the boat. I knew the hours Humprey’s was open and I got there in time to get the sandwiches, but I had failed to preorder them and they were sold out! I was devastated and scared to report that I had failed my one instruction. Luckily, the bakery had loaves of the oatmeal bread they make the sandwiches with and sold me one. I ran to the grocery store and bought a turkey breast, a can of jellied cranberry sauce, and a box of Stove Top Stuffing. I got back to my kitchen in Chilmark and set out to recreate this beloved sandwich. As I handed off the lunch the next morning, I felt the need to confess that I had packed an imposter Gobbler, one of my own design. The men were disappointed, but happy that I had made an effort to come through. That night after the race I got a call from my boss saying that my sandwich was better than the Humphrey’s Gobbler they had been eating on the Island for years! As Christopher and I were flying back to New York City, I clutched the loaf of oatmeal bread we bought at the Scottish Bakery and I couldn’t wait to come home and make Gobblers. We sat eating these tall, tall stacks of Thanksgiving flavors, very grateful for our Fantasy Island adventure. Spread mayonnaise on one slice of bread, layer roasted turkey slices on top, spread on a layer of stuffing, layer on cranberry sauce slices (the can from my cabinet was dated 2004 -eeek!, so I pulled out my homemade cranberry ginger pear chutney from the freezer. I'll share that recipe closer to the holidays! )Top with another slice of bread, gently press down, and cut in half to make eating it a little easier.